Austrian writer; born at Vienna; died at Turin Nov. 30, 1902. After graduating from the University of Vienna he devoted himself to literary work. He was an intimate friend of the poet Friedrich Hebbel. In 1847 he edited at Vienna a monthly called "Der Salon: Mittheilungen aus den Kreisen der Litteratur, Kunst und des Lebens"; on account of the vexatious Austrian censorship, however, he was compelled, after three volumes had been issued, to discontinue its publication. During the upheaval of 1848 he was foremost among those journalists who supported the popular cause. On the surrender of Vienna to the government troops, Engländer was one of the twelve hostages whom Windischgrätz demanded should be handed over to him for punishment. Having had timely warning, he succeeded in eluding the authorities, and reached Frankfort-on-the-Main. Still pursued by the government, he went to Paris, where he published with the help of Baron de Reuter a lithographed "Correspondence" which contained extracts from newspapers. His revolutionary tendencies brought him into conflict with the Parisian authorities, and after a term of imprisonment he was expelled from the country. 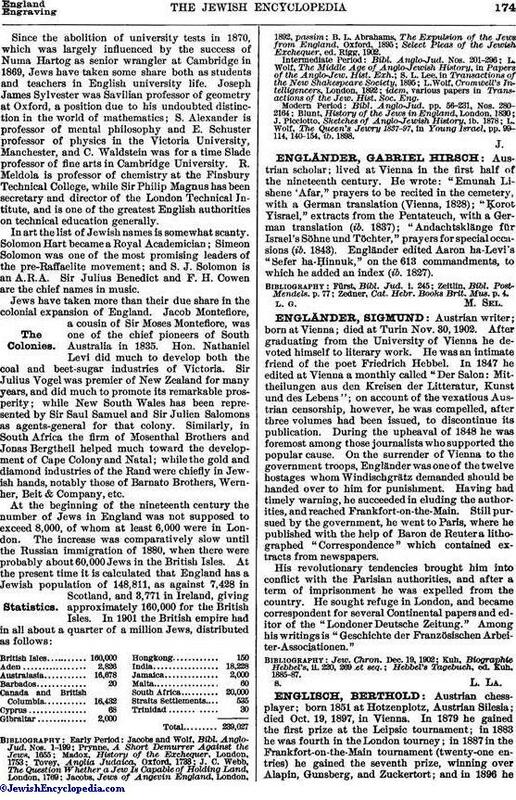 He sought refuge in London, and became correspondent for several Continental papers and editor of the "Londoner Deutsche Zeitung." Among his writings is "Geschichte der Französischen Arbeiter-Associationen." Hebbel's Tagebuch, ed. Kuh, 1885-87.